A typical deck of a home is constructed of a wooden platform built above the ground, although many decks are just built upon and raised above the surrounding surface of the ground. For many years, decks were typically connected to the home's structure, however, recent design requirements by municipalities require a deck to be freestanding for rot protection of the home and safety of the deck structure.. A deck surface above the surrounding ground or surface 36 inches or more is required to have a surrounding railing for safety. Railings must support 200 pounds of lateral force at the top edge without "considerable" movement that would cause concern in an average individual. The railing must be designed to not have openings of more than 4 inches which can allow an infant to fall off of the deck to their death. 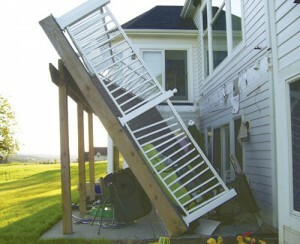 Decks with stairways must have a handrail that can be grabbed by a typical person's hand for support from falling. While some decks are constructed as floating or cantilevered structures tied into the main home's structure, if they are built of wood, they are still considered decks for the purpose of design, inspection, and safety, although they may be called balconies. ADA compliant decks and ramps must also meet standard width requirements for wheelchairs. Most decks are still made at least partially with wood. Even though pressure treated with rot-resistant chemicals, rain rusts the steel connectors, sun bakes the wood, and wind drives rainwater in and chemicals out. Loads of decks were build in the 1980's when decks came into their most popular era, and many, many of them are still around and in use. Many of the decks built in that era were not build to any building standard, and because of deck failures and the subsequent deaths of many individuals, deck standards were developed and strengthened. Twenty years is considered a good test of time for new materials and designs in the construction industry. In that 20 year period nature and use tend to prove or disprove if the quality, longevity, and design standards were correct or flawed. We have learned much with regard to decks in that period. While deck standards, materials, and designs are now much stronger based on the failures and lessons learned over the years. Even with decks built to the newer standards, they are still prone to the forces of nature, and human use and modification, and still need to be inspected on a regular basis. Outdoor raised structures have been built from a variety of materials for centuries. Exterior decks as we know them arrived in the mid-1940's with the end of WWII and the development of the modern suburban homebuilding industry and neighborhoods. Prior to that era, outdoor structures were front, rear, or side porches that were mostly covered from damage by the elements. With the development of the chemical treatment of lumber, outdoor structures began their rise in popularity, really taking off in the 1980's. The most popular past wood preservative, Chromated Copper Arsenate (CCA) was the primary preservative with a track record of decay resistance, until health concerns about the chemical led the wood treatment industry to stop using it for residential lumber in 2003. CCA retention levels were .25 for above-ground use and .40 for ground contact. Current retention levels vary depending on the preservative used. Today's typical wood treatment has retention levels of .06 for above-ground use and .15 for ground contact. There ae now a number of pressure treated lumber preservative cocktails using a range of inorganic chemicals such as: Alkaline Copper Quaternary (ACQ), Copper Azole (CA), Sodium Borate (SBX), and Micronized Copper Quaternary (MCQ). While copper has been known for centuries to be a great protection against microorganism growth, these newer treated wood products may be less toxic, but contain a higher level of copper which is more corrosive to the steel brackets and fasteners than the past CCA-treated lumber. Decks have typically been constructed from pressure treated lumber, however, over the years a multitude of other composite decking materials have come and gone. Decking is the surface boards that one walks on. The alternative deck plank "board" materials can be some of the following: aluminum, varieties of lumber, recycled materials, and plastics. Recycled planks may be high-density polyethylene (HDPE), polystyrene (PS) and PET plastic as well as mixed plastics and wood fiber (often called "composite lumber" or "wood-plastic composites", whch are generally more widely known by specific brand names. The following deck standards are useful when designing a deck or reviewing a constructed deck. Note that new construction or replacement of a deck requires a building permit. MHBI is trained and certified to modern deck design standards through the North American Deck and Railing Association (NADRA.org) and can provide a comprehensive deck inspection. A key element of enjoying your deck for years to come is making sure it is safe and code compliant. NADRA’s “10-Point Consumer Safety Checklist” is a guide for viewing and inspecting the different parts of your deck, with an eye to what might need maintenance, repair, or replacement. Mike Beaudry, executive vice president for NADRA has stated that one should consider a professional inspection. “A professional inspection will examine every inch of your deck, provide information on your deck’s capacity limits, identify any dangerous problem areas and give you a map of what to keep your eye on in the future. If your deck is older, this might include a regular deck inspection schedule,” says Beaudry. Older decks require closer scrutiny. Many of these decks were built before code requirements were in place to protect consumers. Some of these decks may have deck-to-house attachments using only nails. If your deck is older, it is even more important to have it inspected by either a home inspector (NADRA recommends ASHI-certified home inspectors) or a knowledgeable deck builder (see the listing at nadra.org). NADRA member deck builders are required to adhere to a code of ethics and comply with state licensing and insurance requirements. If you find your deck is not safe to enjoy, NADRA advises taking immediate action to have it repaired or rebuilt as necessary. ​ ■ Ask friends and family members for referrals and contact state and local licensing authorities and trade associations such as NADRA. ​ ■ Meet with and carefully evaluate all potential deck builders. Ask to see a portfolio and some samples of the decking and railing materials they prefer to use. Good builders take pride in their work and will be enthusiastic about the possibility of creating a relationship. ​ ■ Pay attention to the deck builder’s experience, licensing, insurance coverage and professional references. When hiring a deck builder, there is more to consider than just price. In addition to the tips above, NADRA recommends homeowners contact their city or county building department to speak with an inspector knowledgeable about deck construction.